Continuing my doc-by-doc look at Sundance 2012: Jeff Orlowski’s US Documentary Competition title CHASING ICE, which follows the efforts of an acclaimed photographer to document climate change. Orlowski makes his feature documentary debut with this film, having previously shot, produced, and/or directed shorts. A graduate of my alma mater, Stanford University, he works with Balog’s EIS as a videographer, which provided the first-hand access to create his stunning film. Joining him on the project are producers Paula DuPré Presmen (Sundance winner THE COVE as well as the first three HARRY POTTER films) and Jerry Aronson (Sundance alum THE LIFE AND TIMES OF ALLEN GINSBERG). Orlowski, who also shot the film, captures the magnitude and majesty of the icescapes surveyed in EIS’ photo project, and their rapid disappearance due to rising global temperatures. 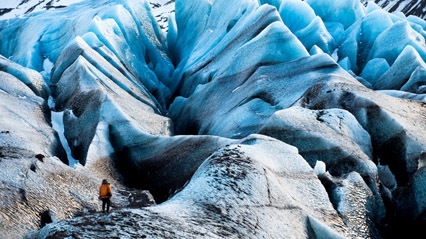 Balog’s personal investment in his work shines through, with the hope that the dissemination of this visual record of glacier transformation can correct public misperception of climate change and become a call to action to prevent resultant life-threatening catastrophe. Check out the film’s website and Facebook page. Orlowski discusses his doc in his “Meet the Artists” interview for Sundance here. For screening dates and times at Sundance, click the link in the first paragraph.